The folks who run German label Marina Records love pop music – especially the kind of pop that bubbled under the synth-pop and widescreen rock of the eighties. If it’s folky, vaguely R&Bish, prefers jangle to distortion and vibraphones to reverbed snare, mixes heart-on-sleeve sincerity and arch cleverness, and, above all, remains intensely melodic, it can find a home on Marina. 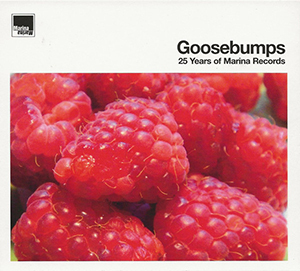 Double-disk set Goosebumps: 25 Years of Marina Records collects nearly two-and-a-half hours worth of crystalline smart pop, hailing from a few different countries and spanning more than a quarter of a century. A good half the tracks come, unsurprisingly, from the U.K. Scottish singer/songwriter and former Orange Juice guitarist James Kirk pops up on his own (“Felicity [Party Mix]) and as a guest with Port Sulphur (“Orient Express”), while Michael Head makes his presence felt with his first band Pale Fountains (“The Norfolk Broads”), the much beloved Shack (“Dragonfly”) and as part of the Pale Fishers (“Southbound Excursion”), presumably a meeting of minds between him and the Pearlfishers, who also appear with “The Time is Right.” (The liners are a bit fuzzy on this point.) The comp also features St. Etienne vocalist Sarah Cracknell (“Miles Apart”), Teenage Fanclub frontmand Norman Blake (the Beach Boys’ “Only With You,” from a Brian Wilson tribute album), Josef K leader Paul Haig (“Listen to Me”), Aztec Camera axeman Malcolm Ross (“Low Shot”) and the long-lost Paul Quinn & the Independent Group (“You Have Been Seen”). There’s even a track from 1967: Dave Dee, Dozy, Beaky, Mich & Tich’s gushy “Marina,” likely included because it’s the single that gave the label its name. While the above hits that pop sweet spot like a rush directly to the vein, many of the most interesting cuts come from artists not as well known to the pop underground. Americans Brent Cash (“Digging the Fault Line”) and June & The Exit Wounds (“Hey Hey Hey” – come back, Todd Fletcher, wherever you are) contribute sparkling tunes. Songwriter Douglas MacIntyre pops up a lot, not only with his bands Sugartown (“25 Years”) and Cowboy Mouth (“Goodbye [She Quietly Says],” not the New Orleans rock group), but also helping out on brilliant tunes by the Jazzateers (“Up To My Eyes”), the Kingfishers (“I Know You’re Down [But I Don’t Really Care]”), the Magic Circles (“Meet Me in Milan”) and Skinner (“Still Messed Up With You,” with Hipsway vocalist Grahame Skinner). The label’s home country represents with Timo Blunck’s Die Zimmermänner (“Pampelmusen”), Camping (“Von Verpassten Gelegenheiten”), Frank Schmiechen (“De Jungs Sind Zurück”) and, surprisingly, film composer Peter Thomas (“Multi-Kolored Mini-Skirts,” from 1973). Outliers include Chicago’s Aluminum Group (“Star Wish”), jazz outfit Colin Steele Quartet (“You’ll Never Steal My Spirit”), electro-atmospheric group Starless (“Starless [Sam Barker Axor Remix]”), the haunted Gazelle (“Fear”), inexplicably adored sunshine pop chorale the Free Design (“McCarran Airport”) and the one and only Alex Chilton (“I Wanna Pick You Up,” from the same Wilson/Beach Boys tribute as Blake). The label also cheekily pays tribute to itself with the delightful “Breezy (Marina’s in the Air),” performed by the Marina Unlimited Orchestra. There’s an almost overwhelming embarrassment of riches here, especially for fans of this kind of pop. Exposure to this wonderfully curated comp may indeed induce Goosebumps.